Our Premium Microfiber Massage Sheet Set represents the ultimate in quality, comfort and durability. 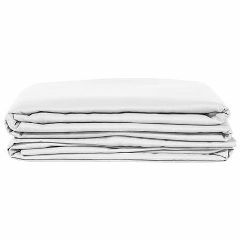 made from 100% double brushed polyester, these light weight, soft as silk sheets are wrinkle resistant right out of the dryer and resist pilling. The perfect addition to your massage or spa table. Available in White, Natural, Dark Chocolate, and Ocean. 120 GSM (Grams per Square Meter). Do not bleach. To keep your massage sheets free of oil stains we recommend washing them as soon as possible (within 24 hours). If you wait longer it will cause the oils to set, making them more difficult to launder. For badly stained massage linens, presoak or pre-treat with a commercially available de-greaser or stain remover. * Wash in warm water and then rinse in cold. Avoid using hot water as this can cause oil stains to set and become rancid. If sheets still smell of oil after laundering DO NOT put them in the dryer, pretreat and launder again before drying.